A single off-the-cuff comment on social media led to one of the best branding-building moments in the growth of cult ice-cream company, Gelato Messina, as co-founder and director, Declan Lee, explained at a digital marketing event, ADMAEngage 2014 (Melbourne), on Monday. The company, which now has six stores in Sydney and one in Melbourne, has never paid for advertising! 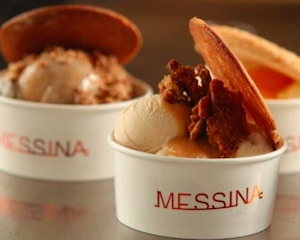 “You guys should do a banoffee pie flavour, and my name is Monique, so you should call it ‘Monoffie Pie’,” wrote a Gelato Messina fan on the company’s Facebook page. Banoffee pie is an English dessert made from bananas, cream and condensed-milk toffee on a base of crumbled biscuits and butter. Lee says his company had been planning to make the banoffee pie flavour and decided to call it Monoffie Pie for “no reason” other than to thrill their fan. But the brand-building moments didn’t stop there. Six months later, Monique’s boyfriend contacted Gelato Messina to explain he was going to propose and asked if the company could help him “set something up”. The pair went to Gelato Messina to get dessert, and when Monique went to the cabinet, the Monoffie Pie tub included a special message: “Will you marry me?” Of course, she said yes. At the wedding, the only dessert available was Monoffie Pie! The advertising value of the whole experience would be difficult to put a price on, but Lee emphasised that the exchange has to be an authentic and honest one. “Honesty is our company value,” he says. None of the company’s four directors knew the customer or her social media acumen. Their gesture was an authentic, honest response to a social media post, and its evolution simply the result of the conversation between the company and its fans. Content is a conversation. Keep it real.